Hello friends!!! It's Friday! Already!! And I am soooooooo glad!! I'm ready for a weekend, how about you?!?!? 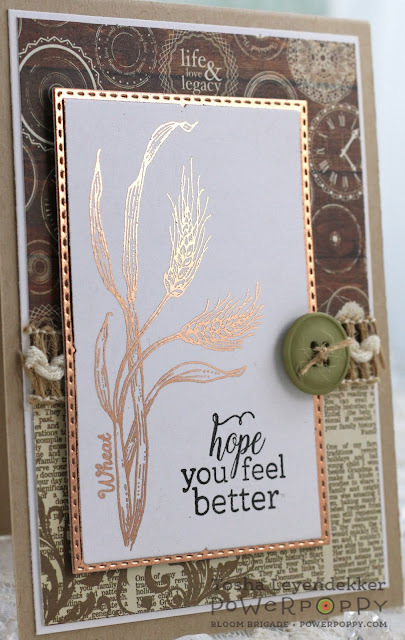 But first, before I start my weekend, I have a Power Poppy card to share with you, that I made using one of the new Power Poppy Clear sets called Prairie Cheer. I've been Minc'ing again too, and oh is it so much fun. I LOVE wheat!! Seriously...the texture, the color, and the fact that it screams Fall (even though we plant ours in the winter and harvest it in the Spring here in central CA). 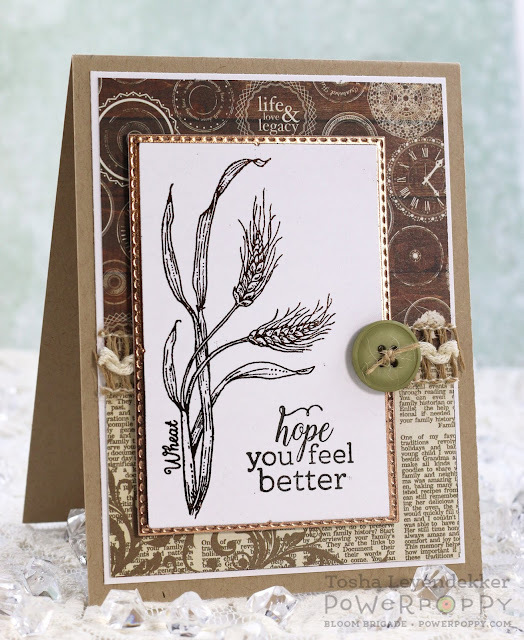 I thought it would be fun to Minc this gorgeous Wheat image that Marcy has designed, and I LOVE how it turned out. What a perfect image for a "guy" card, and Minc'ing it gives it that little extra sumpin' sumpin'. 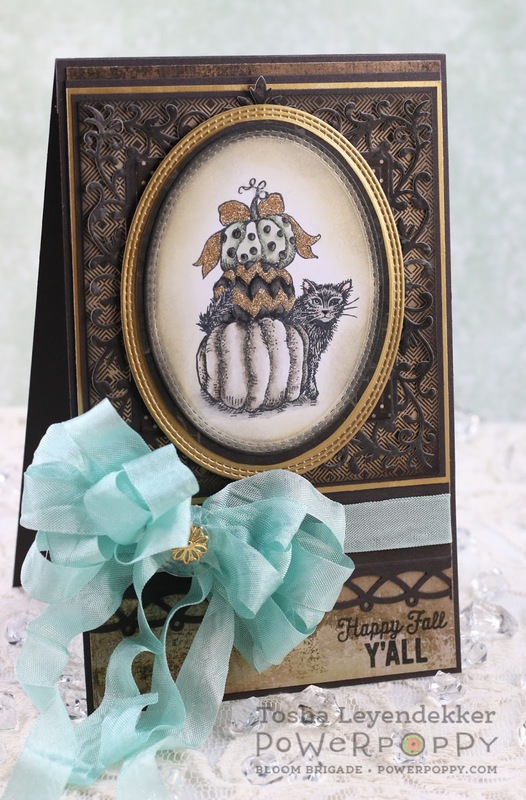 For instructions on how I Minc a stamped image, visit my blog HERE. I also included a link (in that post) to Becca's blog since that's where I first saw how the Minc machine was used. In this second photo, you can see what the image looks like straight on without the light catching it "just right". I also kept the sketch really simple, since it I was going for a clean masculine look, and just added a burlap trip and button. So easy, but with a splash of pizzazz!! 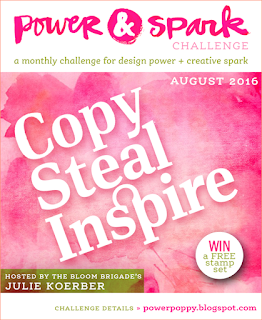 There's still time to participate in this month's Power and Spark Challenge too. Shoot...you could win some free Power Poppy images. How awesome would that be!!! That about sums up my project for today. But, in case you haven't already, you really need to check out what the following Bloom Brigaders have to share. Seriously!! These gals ROCK!!! • Select discounts on clear stamps throughout the shop! Now, for today's card. I used the new Power Poppy Set called Feeling Fall. 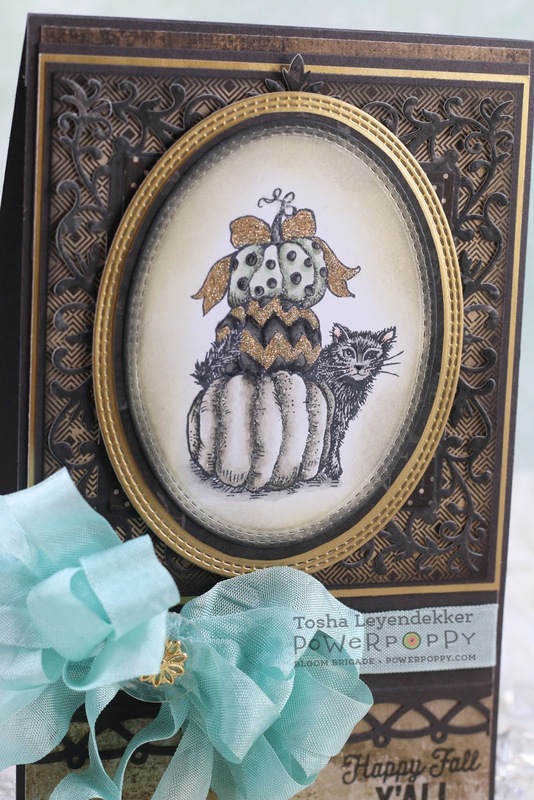 Today I created a card using the pumpkins with the cat. Isn't that image just super adorable!?!?!? I am in serious LOVE!! I had a hard time getting a clear picture of the image instead of focusing on that humongous bow.... *sigh*...so, if you click on the pictures, you can see the details better. I was going for a kind of vintage feel, and somehow added in some sage green. I know...not your typical Halloween color, but I actually like the colors. The image is colored with Copics, and I used my Quickie Glue Pen and some glitter for some extra Halloween fun. Below is a close up for a better look at the details. Hello, hello, hello!!! Power Poppy is previewing another set from the new collection Nature and Nurture today, and it is one of my all time favorites called Feeling Fall. Seriously!! 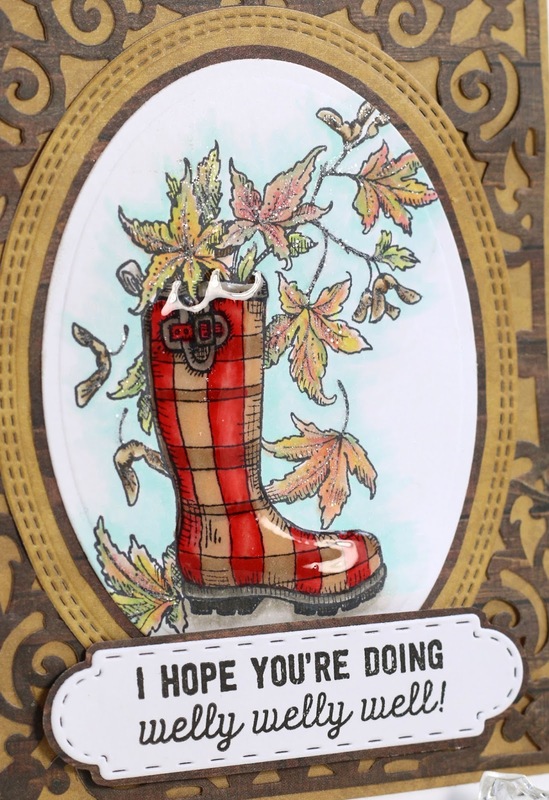 I used the Welly image for today, and will be sharing the pumpkins tomorrow because I couldn't choose which image to feature. They're both so unique and A-D-O-R-A-B-L-E!!! I colored the image with Copics, and added Glossy Accents to the Welly boot because it has to be shiny and wet looking. I also added some glitter to my leaves because I have been suffering from "glitter withdrawl". I've included a close-up below so you can see the shine and glitter a bit better. Thank you so much for dropping by again!! I am honored by your kind supportive comments! Tomorrow is release day, and one more day of previews, so come on by again!! Hello again friends!! 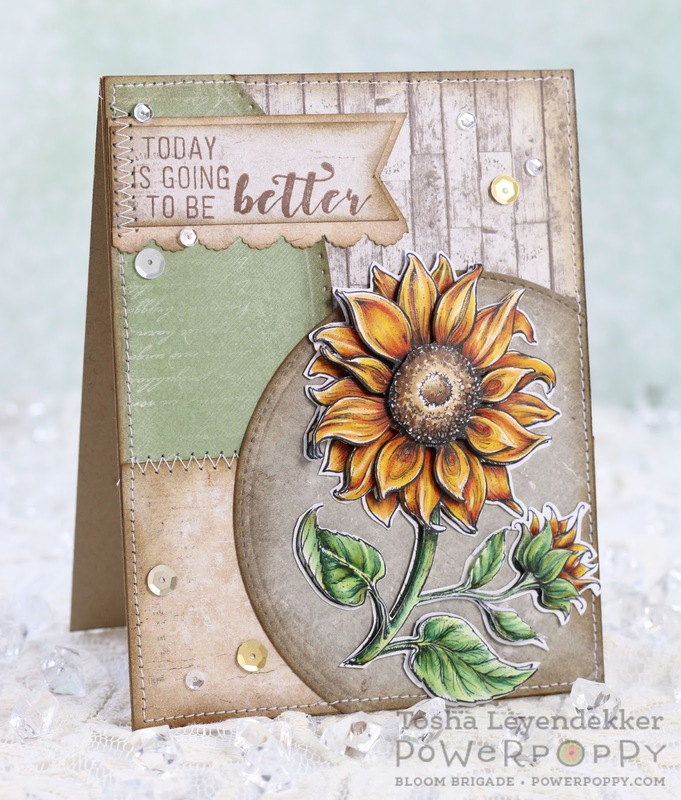 I'm back again with another Power Poppy card to share today featuring the clear stamp set In Praise of Sunflowers. Isn't that a great name for a set? I ADORE sunflowers. They are one of my absolute favorite flowers, and this set has two fabulous sunflower images that were originally released as digital. Now, you can get both images along with some unique building sentiments. I stamped the sunflower four times, colored them, and cut them out in layers for a 3-D effect. I also burnished the backs of the center and leaves for some additional texture. I colored this baby awhile back, and forgot to record the Copics I used, so I'm sorry that I can't provide the list. But here's a close up angled view so you can see the dimension a bit better. That's it for today. Stop by tomorrow for a preview of another fabulous Power Poppy set! Hello friends!! Power Poppy will be releasing 3 new Clear Stamp sets on Friday the 19th, called Nature and Nurture, and you definitely will want to take a gander at these new images. Marcy has done it again, and today we're previewing the set called Prairie Cheer. It has three beautiful images along with 4 uplifting sentiments along with their floral names. 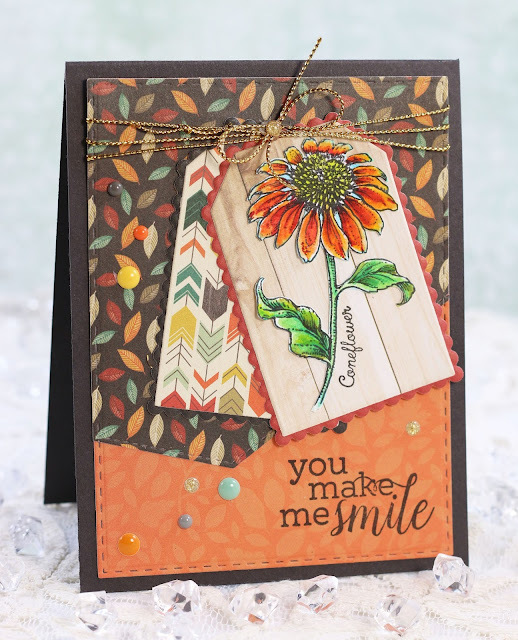 I used the Coneflower along with it's coordinating name for my card today. I've been stepping out of my box lately and trying new things. Some successful, and some, not-so-much. But at least I'm trying, right? Today, I started by coloring with my new Zig Clean Color Markers. 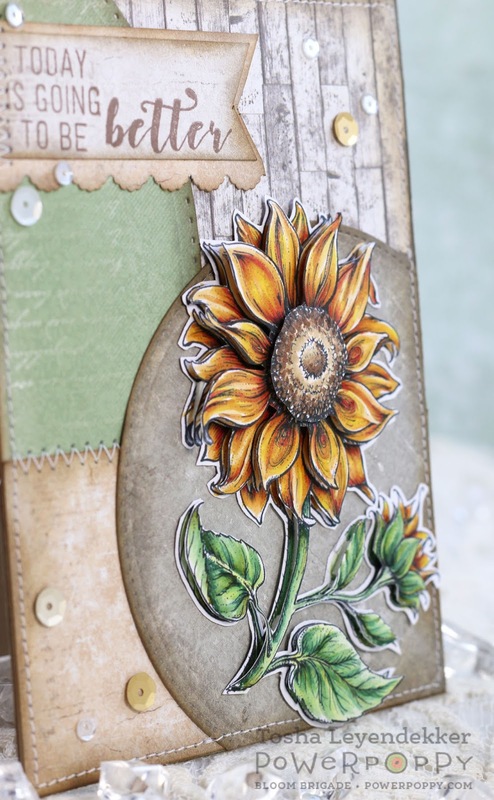 (enabled by dear Dina Kowel) I stamped the image onto Tim Holtz Distress Watercolor Cardstock with Versafine and heat set it. I then proceeded to color the image with the Zig markers. No water pen needed or used. The colors blend beautifully on their own. It was quick and easy. I then cut out the image and adhered it to a tag diecut piece of cardstock. To add the sentiment, I used my Mini-Misti to get the sentiment placed exactly where I wanted it. I curved it a little to fit with the stem. Hello my creative friends!! Happy Friday! 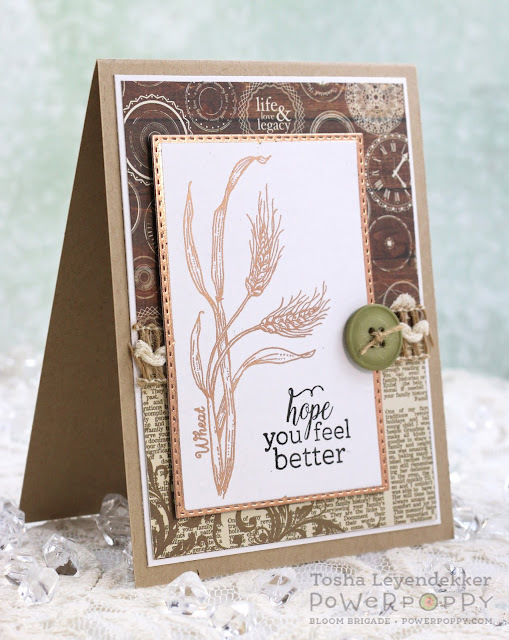 I am excited to share my card with you today because I tried something totally new to me... I made some clouds with Copics. Before I share why I'm so excited about that, let me tell you about the set I used and why. Today I used one of Power Poppy's newer digital sets called Fly Guy. I don't know any fly fishermen, but my husband and kids love to deep sea fish. So, I made this card for my husband for that reason and one other. 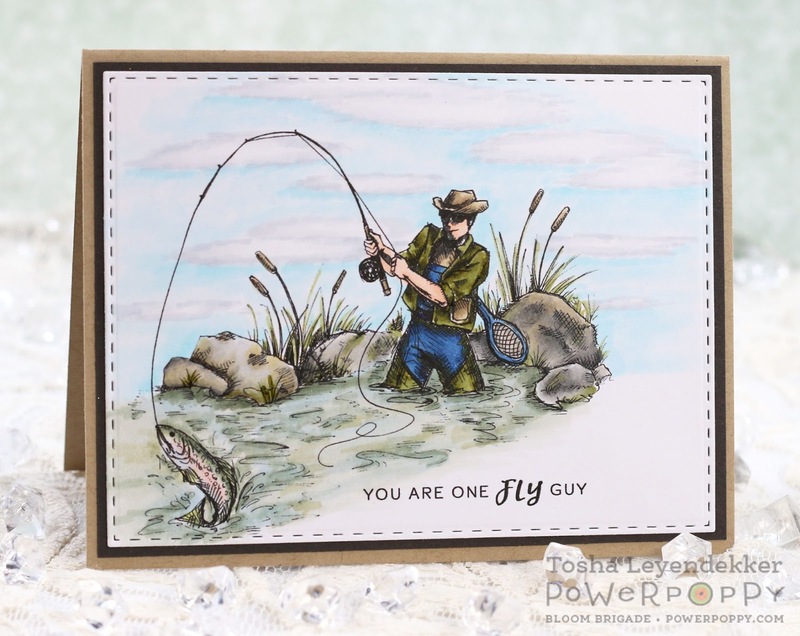 I know the sentiment is supposed to apply to "fly-fishing"...but that doesn't apply here. So, I thought it could apply to the fly infestation that takes over our dairy farm in the summer months. Am I reaching? Probably!! But believe me...if you lived here during the summer, you would so get it. We are constantly swatting flies in the the house all summer long, and even into the Fall months some years! Thankfully though, not as much as when the kids were younger and they were running in and out of the house without closing the doors fast enough. That is definitely a skilled practiced and learned quickly on a dairy farm. "City Slickers" (Please don't take offense with that term. I use it lightly and with affection, because believe me...my husband deemed me one when he met me, and even after being married for over 27 years, and all of them on the farm, he still says I haven't earned the "farmer" moniker because I was born and raised in town...*sigh*) are always warned when visiting, to NEVER EVER leave a door open. Open and close IMMEDIATELY!! So this card is meant for more of a joke. Although the image is anything but a joke. I LOVE how Marcella drew this with the rocks and awesome cattails (I adore cattails) in the background!! I decided I wanted to add some clouds to the sky though, but had no idea how to go about it using Copics. So, I scoured Pinterest. I used the Kit and Clowder Tutorial found HERE as a guide. I didn't want cute fluffy clouds for this masculine image, so I made mine more wispy, and was really happy with the look for my first time. I need practice for sure, but it's a start, and we all improve the more times we do it, right?!?! Anyway, that sums up my card and the story behind it today. I hope I've inspired you to get coloring and maybe even try something new.